The Beauty Scoop! 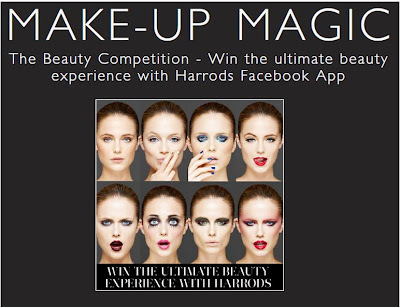 : Harrods Facebook 'Makeover' Competition! The beauty team at Harrods have created eight fabulous 'key' autumn/winter looks for 2011, using eight of 'the most adored cosmetics collections' including some of my favourite brands such as Chanel, Tom Ford and Burberry. They're celebrating this by giving away a makeover for one lucky person, and up to five of their friends! To enter you need to visit their Facebook page and 'Like' it. This will give you access to the competition where you can then browse the looks and choose your favourite look (for you and your friends) to enter the competition! If you win, you will get an in-store makeover for you and your friends... and go home with ALL the products featured in your chosen look! Competition ends at midnight, on Monday 12th September and the winner will be announced the next day on their Facebook page. Full terms and conditions are available on their Facebook page! I love a bit of luxury and I bet you all do too, so when I saw this in an email, I just had to let you all know!